Yesterday we hosted a simple birthday party for little Owen, who is turning 2 this month! My mom and sister were in town so we decided to seize the moment and celebrate Owen’s big day with them. Owen is obsessed with the book Little Blue Truck. I love making fun cakes for my kids’ birthdays, so I decided to give the truck a try. I had no plan going in and thankfully it all turned out okay! I’ll do a quick post this week explaining how I put the cake together as it was quite simple! Owen loved the cake and thoroughly enjoyed his party – although we had to stop singing “Happy Birthday To You” halfway through because he burst into tears with all the attention! So sweet. Looking forward to seeing your menus! As always, they are great inspiration when planning each week! Please share no matter what your menu looks like! Sunday-Pot Roast, sorry you inspired me for that one! Are you from central New York? Chicken Riggies (which I’ve never made) is a regional specialty. just looked chicken riggies up – looks delish! I grew up in CNY but have never had Chicken Riggies. I have a recipe from Cook’s Country that I’ll try some day. Sunday – Pot Roast. Agreed, haven’t had it in forever. Sounds great. We had the whole soccer team over for a bbq yesterday and have plenty of leftovers to work with. I can’t believe it’s been 2 years already, either! time flies!!! So cute, Jane! I love when the little ones are so over-stimulated, they just can’t handle it. Very cute (most of the time). My menu comes with commentary this week…. how do you make the chicken thighs? do you have a link? I started looking through old menus this week for ideas. Thursday – out for a cocktail party! Saturday – out – and…my husband is finally back from a 2 week business trip! Yay!! aww your truck cake turned out adorable. Not sure what our meal plan is for next week. We just got back from a long nature hike for the first day of fall. Here’s my meal plan for the week! Happy Birthday to Owen!! What a fun cake…they are so adorable when they are that young. Happy Birthday to Owen and you as well, Jane! Monday: Brown Sugar Pork Chops, mashed potatoes, green beans (didn’t get to it last week). Happy 2nd Birthday to Owen! Great job on the Blue Truck cake. Happy Birthday Owen and Jane! You did a great job on the cake, so cute! Wed: I’m going to Bath for the Smitten Kitchen book signing, yay! Sunday – Pasta Bake – Whatever odds and ends are leftover from the week! saturday: turkey dinner? i have one turkey left in the freezer and it’s finally cool enough to run the big oven! I’m in awe of the cake. Really. I’m doing good to make 2-D cakes; 3-D ones intimidate me. Well, besides layered cakes that is. We’ve been traveling this past weekend and will again this coming weekend. Our menu really reflects this part of life right now. While we enjoy the reasons for traveling, we are looking forward to being home. traveling can be great, but it really does make you appreciate home! 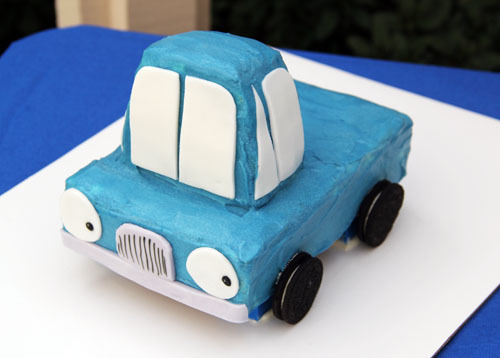 Your truck cake looks adorable! It brought back some great memories for me and the cakes and parties I would do for my kids when they were little. Even now as teenagers, I still will do fun things like that for them, even if they think I am silly! OMGOSH that cake is so cute! HBD to your Owen! My Owen just had a bday too, we went with a “backyard bug hunt” theme. love making cakes for my lil man too! His was a round magnifying glass with red almond M&M “ants” on it this year. your party sounds SO cute! I can NOT believe little Owen is 2 already. I remember your posting about his birth! The cake is adorable. I can’t believe it either, sara. it went so fast…but at the same time the time after his birth seems like another lifetime! as usual, thank you all for your menus! reading through them now as I plan for this week! and thank you for all the sweet birthday wishes and cake compliments. thank you! !